Adventures of Sound Tech Guy: What Artist or Band Would You Like To Mix Sound For? What Artist or Band Would You Like To Mix Sound For? 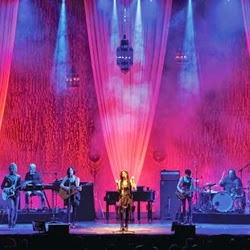 Tonight I was reading about the tour profile of Canadian artist Sarah McLachlan. In the article, the tour technicians were saying how it felt like working with a big family during the tour. These seasoned technicians all said that it was their favourite gig to come home to. The techs all loved working with such an awesome group of very talented musicians. Those are great reviews coming from the guys who put together the shows each night! Now, you will read my list and notice that I picked All Canadian artists and bands. I truly love Canadian music and most I have seen in concert before. My list is a reflection of the kind of music that I enjoy listening to. I would love to have the opportunity to get behind the console and mix all these wonderful artists. If not mixing the show, then the chance to work on the sound crew getting the systems setup for the shows. A message to the touring techs on these shows. Would you be able to offer me this opportunity on a show? If so, please contact me directly to discuss the details. I would appreciate the future opportunities! Here is my card. Cheers!!! 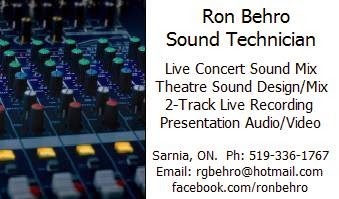 Labels: Adventures of Soundtechguy blog, artists I would like to mix sound for, prosoundweb article, Ron Behro, ronbehro.blogspot.ca, Sarah McLachlan tour profile.